Banks and financial firms are doing it. Auto manufacturers are doing it. So why shouldn’t people? Since the 2016 Brexit vote, dozens of the world’s largest corporations have announced plans to relocate outside the United Kingdom. Why? So they could continue doing business in the European Union, the world’s largest and most frictionless trading bloc. With B-Day looming next March and no clarity about what it will bring, we’re offering up the five best destinations for those citizens of the UK who might be looking for a little certainty, at least until the storm blows over. Because never in the annals of history has there been a moment more uncertain than Brexit. Or one that promises to be as uniquely unpleasant should the UK leave the EU with no deal at all. Anything we write about life in the UK post-March 2019 is essentially guesswork. Somebody pass the tea leaves and tarot cards. Creating our other “best-countries” and “best-cities” for expats lists have been relatively straightforward exercises – we decided on a methodology and benchmarks and started researching. Making sense of the post-Brexit landscape in Europe is a lot trickier. 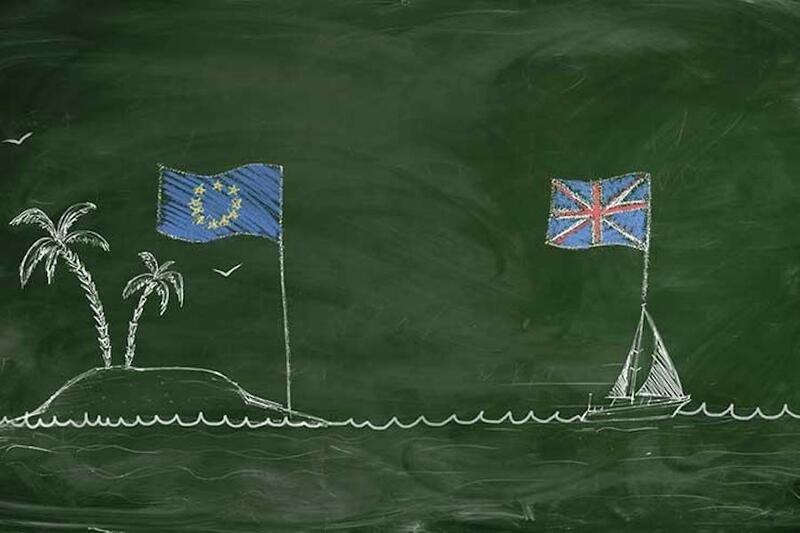 Worst-case scenario and there’s a no-deal Brexit come 29 March 2019, will all expats from the United Kingdom have to clear out of mainland Europe? Will EU citizens be rounded up, loaded on barges in Dover and shipped over to Calais and Ostend? Who can say? The answer is, no one. No one has a clue as of 1 December what’s coming. So we started thinking we should start throwing out some scenarios and options for those who want to maintain the freedom to work and travel throughout the Schengen area. In the event the current proposed deal between the May government and the European Union passes, there will be a transitional period that will give UK citizens a brief window to move within the EU without the additional barriers usually faced by third-country nationals. So if they want to make use of this “limited-time offer” to make the move to the continent, now would be the time to start researching if and where they might like to set up home. BUT, that’s only if Prime Minister Theresa May’s version of Brexit passes the British parliament. This also goes for EU nationals contemplating a move to the UK, for whom it may also be a “now or never” scenario. At the moment it seems the current rights around freedom of movement would stand until the end of the transitional period. The previously agreed date for the transition period to end was 31 December 2020, but it now looks as though that could possibly be extended further, perhaps even until after the next general election in 2022. Also, the European Commission is proposing allowing UK citizens visa-free travel to the Schengen area post-Brexit if the UK offers reciprocity to EU citizens. At the end of the day, we sense Boris, Moggsy and the Rigid Right are going to force a no-deal exit. In THAT case, we hope – but don’t know – that EU countries would throw Brits a lifeline so they could keep their jobs in the EU, or move businesses there. But who knows … a lot of guesswork in all this. Germany, the Netherlands and other EU countries know that Ox-Bridge pump out the best and brightest, and they’re going to dangle some sort of bait in front of highly skilled internationals. And if you’re a highly skilled expat, lucky you, because there’s a War for Talent, and more and more EU countries are liberalizing their immigration requirements to attract you. • Sweden: Even though everyone speaks English and it has liberal immigration policies, Sweden has worse weather than the UK. Ditto for Norway and Finland. Stockholm, in particular, has one of the worst housing shortages in Europe, and the cost of living anywhere in Scandinavia is probably higher than in the UK. • Switzerland: Yes, the Swiss have visas for retirees and students. But while British pop stars and Formula 1 drivers tend to live close to their money in Geneva, there’s nothing much here for the average Nigel and Adele because it’s the most expensive country in Europe. • Luxembourg: You can get along quite nicely in Luxembourg only speaking English and there are plenty of jobs. But this is a fussy little country that’s kind of forgettable. There are a lot of people who’ve visited Luxembourg without even realizing it. But because Luxembourg goes back and forth with Switzerland as the world’s wealthiest country, it’s expensive to live there. • Far right governments and language issues in Italy, the Czech Republic and Hungary take them out of the running. We’re making certain assumptions, chief among them that you’re not broke. Our imaginary UK citizen works for a company based in the EU and has assets and skills. Here’s what we’re guessing you’re looking for post-Brexit. English ranking: We rank each country by the percentage of the population fluent in English, according to CIA World Factbook, or other sources if noted. Healthcare ranking: We use various rankings of healthcare systems, though mostly the World Health Organization. Ease of immigration: This is the great unknown. But we’re rank possible destinations by ease of immigration for non-EU citizens because that’s what you’ll be. Career opportunities: We use annual GDP growth for this one, though if there is data for jobs created in 2017, we’ll use that too. Housing: We use various data sources including Expatistan to survey the cost of renting, and cost of purchasing a house or apartment. Education: We use the number of international schools for this ranking. Friendliness: We’re tapping into our Dispatches expat network and their collective experiences. Safety: We’re using simple crime statistics as well as country profiles from the U.S. Department of State. A few months ago, this wouldn’t have even been close. Spain would have been No. 5. Official British government officials indicate about 270,000 Brits live in Spain full-time, but we’ve seen numbers as high as 1 million spend at least half the year there. So Spain already is home to the largest number of British expats living in the EU. That means everything from English-language residential rental companies to British grocers are there already providing the infrastructure to make the transition practically painless. Perhaps 300,000 Brits live in France, mostly in the Dordogne region around Nice, so both countries have appeal. At the moment, France has the stronger economy despite the Yellow Vest riots in the news. Also, France is taking steps toward making it easier for Brits to get long-term visas. AND France is launching a global advertising campaign to entice international students away from the UK post-Brexit. France is adding more classes in English at its universities. France has started offering significant, long-term tax breaks to bankers to leave London for Paris, and Spain is offering a similar deal. When you look at the two countries, it almost comes down to personal preference. But France is clearly pushing to become more competitive in the digital tech arena. So, take out that funny little two pound coin and flip it. Not surprisingly, the empirical data is similar for both. About 40 percent of French people speak English fluently, and about 22 percent of Spaniards, so France gets the edge. But Spain has far more British expat communities. Depending whose data you use, France ranks at the top globally. The WHO rates the French system No. 1 in the world, and Spain at No. 7. According to the WHO, Spain spends about 3,000 euros per year on healthcare, about the EU average. Life expectancy is 86 years for women and 80 years for men. France spends 33 percent more, or 4,000 euros per person and French life expectancy is roughly the same as Spain. Spain has recovered more quickly from the Great Recession, with 3.1 percent GDP growth in 2017, compared to 1.2 percent by France. France added 50,000 new jobs at the end of 2017 as employment returned to pre-Great Recession levels. But this year, Spain’s economy started to catch fire, with 470,000 new positions created between April and June. France gets a slight nod here in that it’s pushing hard into next-gen tech with startups. Both countries have large and varied economies with manufacturing, tourism and aviation. Spain is one place you can already see the effects of Brexit. Brits are buying houses like crazy. Both countries have tight housing markets in major cities. It’s nearly impossible to find an apartment in the center of Barcelona, and more than one of our colleagues have fallen for apartment-deposit hoaxes there. Paris is only for the rich, with Expatistan data showing it’s only slightly less expensive than London. But if you’re willing and able to live outside the larger cities, there is a lot of housing coming online in both countries. Again, a tossup. France has a lot of international schools. But so does Spain, and their tuition is less expensive. Anecdotally, Spain wins out, through our experiences in France convince us the French get a lousy rap. Also, check out Alice Verberne’s adventures in France. Both countries are No. 1 on our list of culture and travel opportunities. We know that’s impossible, but they are. With France’s problems in Paris and Nice since 2015, Spain gets the nod as probably the safer choice. It has among the lowest rates of violent crime in Europe, much lower than the UK. The murder rates per 100,000 inhabitants are roughly the same. For most of us, our image of Portugal is a travel poster … blue seas, sunny skies and ancient cities. And that’s accurate. But below the surface, Portugal is an aging country that’s actually been losing population up till 2017. (We know … we work at our Netherlands headquarters with many Portuguese expats.) Government studies project that Portugal needs to attract 75,000 new working-age residents every year to maintain a stable working population to sustain the pension system as the numbers of workers decreases and retirees rise. Portugal’s biggest advantage is that many people can afford the terms of their Golden Visa program. And let’s face it … there are worse places to live (we’re looking at you, Russia.). Let’s look at the Golden Visa deal, which we’ve written about ad nauseam. Basically, you get a long-term residence permit if you either invest in real estate, start a company or transfer a sizeable amount of capital to Portugal, a sizeable amount being at least 1 million euros. Okay, what if you’re not Lewis Hamilton and you work for a living? To stay longer than 90 days, UK citizens have to apply for a Registration Certificate from the local Camara Municipal (Town Hall). But for a lot of Brits who want to maintain connections to the EU while working on their tans, this could be the place. The Portuguese are kind of like the English … they’re not big into bilingual. Only about 30 percent speak fluent English according to Eurobarometer. BUT, Portugal has a fairly large English expat community. The unemployment rate is 6.8 percent as of August, but youth unemployment is closer to 30 percent. To work here, you have to already have an employer or create your own business, which is pretty much the way of the world. It would be difficult, though not impossible, to show up and start looking for a job if you’re a UK citizen. All that said, Portugal is in breakout mode with an increasing number of opportunities in startups and innovation. Housing costs – rentals and purchases – in Lisbon, for example, are about 50-percent lower than in London, according to Expatistan. If you want to live in Porto, housing is even less expensive there, and there seems to be plenty of availability, which is NOT the case across most of Europe. There are international schools in Lisbon and Porto. Tuition ranges from 6,000 euros per year to about 18,000 euros. No Dispatches contributors can ever remember any negatives on trips to Portugal. And the Portuguese citizens we’ve hosted through TechTrek were amazing. Are you kidding us? Sun, sea, a foodie scene, wine and mountains. People pay good money to come here on vacation. Who wouldn’t want to live here? The number of murders in the course of a year for the entire country, population 10 million, is less than in one mid-sized US city, about 120. But street crime targeting tourist is not unheard of. See the US Department of State profile here. There are a multitude of reasons why Brits might consider making the move to the “powerhouse of Europe,” the No. 1 economy based on GDP. Firstly, Germany offers a lot of opportunities for employment. A booming economy means a continuing demand for skilled workers, and there are currently a record number of vacant positions across the country in a wide range of key sectors, including IT, construction, hospitality, healthcare, social work, childcare and education. In order to fill these positions, Germany has gone to great efforts to attract skilled workers from outside the country, including plans to relax immigration requirements for non-EU citizens, something which might benefit British nationals post-Brexit. What’s more, employment opportunities in Germany following Brexit may even be set to increase, as British-based companies begin to jump ship to other European countries. Frankfurt has so far done an excellent job of attracting companies within Britain’s financial sector, and Brexit uncertainty has already helped to make trendy Berlin a more attractive alternative to London for Europe’s buzzing startup scene. Both of these sectors offer a great number of opportunities for fluent English speakers. Once you’ve found employment in Germany, you’re set to enjoy fantastic employment benefits and protection. On average, German employees benefit from a shorter work week, more days of annual leave, and better employee protection than their British counterparts. See more on Germany here. Germany gets dinged on the pervasiveness of English compared to, say, the Netherlands, Sweden or Denmark. About 56 percent of Germans speak English, according to EU surveys. BUT, our experience is, most people in cities speak English fluently. Still, if you’re going to work in Germany, you’d better speak German fluently. Germany spends more than 5,200 euros per capita on healthcare, or about 11 percent of its GDP, according to the WHO. This is roughly the same as Sweden. But at 80 years, German life expectancy is statistically lower than Spain, Italy and other less affluent EU countries. Our personal experience is, providers in the urban areas are better trained and compensated than in rural. So Berlin, Munich and Frankfurt are likely to offer the best quality of clinical care. Getting a long-term visa in Germany for non-EU people can be very tough. You can read Lily Cichanowicz’s post here about all the hoops she as an American had to jump through to get her freelance artist visa. But German policymakers just passed legislation to make it easier for German companies to open hard-to-fill jobs to ausländers. The Fachkräftezuwanderungsgesetz – or skilled labour immigration law – makes it easier for employers to recruit non-EU citizens. Skilled workers such as coders or IT techs can now enter the country for six months in order to look for a job in Germany. Last March, the number of unfilled jobs in Germany hit 1.2 million, according to the Institute of Employment Research. Though the Germany economy has cooled a bit since then, this is still a country that makes the most sophisticated machinery, autos and software in the world. With an aging demographic, talent is at a premium. Here’s the Make it in Germany portal, the official government link to jobs. Germany is a big place with lots of cities. Unfortunately, some of those cities such as Munich are quite expensive even by British standards. And cities that used to be fairly affordable such as Berlin really aren’t anymore. We started to throw in data from Expatistan and Numbeo. But we suspect that with companies moving from London to Frankfurt and Berlin, prices and rental rates are changing faster than they can track them. Expatistan does find that housing in Munich and Frankfurt is 30 percent to 34 percent less expensive than London. Again, Germany is a diverse country. But all the of the major cities including Berlin, Frankfurt, Düsseldorf and Munich have great internationals schools and lots of them. Here’s the why we give Germany a 10: Universities are among the best in the world, and mostly free! Like the French, the Germans tend to get a bad rap as rigid and unwelcoming. And of course, one can say that about individual people anywhere, especially in London, which gets our vote as one of the least friendly cities in the world. But our personal experiences are that a significant percentage of Germans are crazy funny and warm. If you doubt us, do a casual survey of the number of American military personnel and corporate expats who marry Germans. Someone is making an emotional connection. With Berlin, Munich and the Alps, Germany lays claim to one of the greatest travel, arts and culture destinations in the world. Now, throw in the autobahn and super-fast trains connecting it all and you have one terrific destination for adventurous Brits. For a country of 83 million residents, Germany is surprisingly safe. In 2017, the number of crimes committed in Germany dropped to the lowest since 1992. There were fewer than 7,000 reported cases for every 100,000 inhabitants. Even the number of bicycle thefts dropped by 10 percent. However, murders increased by 3.2 percent, to 785 cases. For some context, the UK and its 60 million people had 740 total murders in 2017. But British crime rates are rising, while crime in Germany is dropping. What? You were expecting Albania, maybe? The Netherlands makes sense for Brits on so many levels, including pure proximity to Blighty. You get homesick, you’re back in London, Manchester or Liverpool in an hour from Eindhoven Airport or Schiphol Airport. Not only does everyone speak English, English is the main business language here and many university courses are in English. Broadcast television shows are in English with Dutch subtitles, and it’s not unusual to hear Dutch people go back and forth between English and Dutch in ordinary conversations. The climate is basically the same as London’s. In our experience, Brits tend to come here and stay because the Netherlands look and feel a lot like the UK, but is a higher-functioning society with less crime and ethnic strife. The Netherlands, or at least Amsterdam, is familiar ground to so many Brits who come here on vacation, or with wedding parties or lads trips. Also, overall, it’s probably a bit less expensive to live in the Netherlands – with the exception of Amsterdam – than in major British cities. Finally, the Dutch are positioning themselves to cash in on Brexit, so look for incentives ranging from offers of long-stay visas to financial incentives to relocate businesses here. To confirm our view, the European Medicines Agency is sending staff on holiday to the Netherlands to persuade them what a great place it will be to live, according to Politico.eu. There you have it …. About 90 percent of Dutch people stated they speak English fluently in EU surveys. Only Sweden and Denmark have similar percentages of English speakers. The Netherlands spends more than 5,000 euros per person on healthcare, among the highest rates in Europe and its shows. Hospitals tend to be first-rate, and there are more than enough providers to meet demand. That said, life expectancy at 80 years for men and 83 years for women is a bit lower than Spain, Italy and other countries. One reason could be that the Dutch smoke. A lot! Also, the rate of skin cancer here is weirdly high because the Dutch over-indulge on vacations to sunny climes. We can tell you from personal experience that Dutch healthcare is incredible. We’ve found ample providers and affordable insurance rates. The Netherlands doesn’t have a Golden Visa. But if you want to put up as little as 9,000 euros to register as a partnership, you can get a long-term residence visa. Otherwise, you have to get a ride with an employer. But locating here for non-EU citizens is far easier than in France or Germany. The Dutch have some of the largest tech companies in Europe, including ASML, NXP and Philips – and they’re all hiring. There are also lots of jobs in lots of categories including marketing and teaching at international schools if you have the credentials. The demand for talent is so great that the luxury outlet center in Roermond recently had 1,200 openings and no applications. BUT (and there’s always a “but”), for an employer to hire you, you need skills they can’t find domestically. The Netherlands is about 20-percent cheaper than Switzerland and Luxembourg, according to Expatistan, but prices are rising. The good news is, there are hundreds of new residential real estate projects going up all around the country, especially Eindhoven. Still, if you think the Netherlands is the place, expect to devote six months to finding a house or apartment, especially if you just have to live in Amsterdam. Utrecht and Den Haag also have extremely tight housing markets. There are lots of international schools in most big cities, and tuition tends to be significantly lower than in Germany and other countries. Universities in the Netherlands are also less expensive than their British counterparts but are NOT free to non-EU citizens like in Germany and Switzerland. This is totally subjective: We’ve never had a negative experience here, but countless encounters with random kindness. That said, even the Dutch will tell you that if you live in the Randstad “above the rivers,” that Calvinist culture is far less welcoming than “below the rivers,” where the Roman Catholic influence holds sway. In our two years here, we haven’t even begun to scratch the surface of stuff to do and see. The Netherlands has more than a dozen must-see cities, towns and villages outside of Amsterdam. It has some of the world’s greatest art museums and nearly every little berg has a Michelin-starred restaurant. If you’re young, the EDM and concert scene is easily the equal of London. Violent crime in big cities such as Amsterdam and Rotterdam is starting to be an issue. Most murders are linked to drug syndicates based in Eastern Europe. Otherwise, for the entire country of 17 million, the number of murders each year is fewer than in a small US city, 158 last year. But that number is up from 112 for 2016 and 76 for 2015, a record low. Street crime is only a problem in Amsterdam. And the chances you’re going to get caught in an American-style mass shooting are pretty much zero. Here’s the U.S. State Department security profile. Brits looking to relocate after Brexit should consider the island of Madeira. Already home to a large community of British expats and retirees, Madeira has a number of benefits for anyone wanting to relocate. • Let’s start with Portugal’s low tax rate. Brits who retire to Madeira (or anywhere in Portugal, really) are not subject to tax on their pension income for the first 10 years, thanks to the country’s non-habitual residency regime. Those who plan to continue working will enjoy a flat 20-percent tax rate rather than up to 45 percent, the rate they are currently paying in the UK. • If you get homesick, there are multiple daily flights between the UK and Madeira’s Cristiano Ronaldo Airport, which makes it easy to visit friends and relatives or invite them to join you on the island. • Although Portuguese is the official language in Madeira, English is widely spoken, especially in tourist areas. • Residents of Madeira enjoy a subtropical climate with year-round sunshine. • Residents of Madeira enjoy a low cost of living. Renting a one-bedroom apartment in the center of Madeira’s capital city, Funchal, costs approximately 500 euros. In London, it costs almost four times as much. For an “apples-to-apples” comparison, check out Numbeo’s Cost of Living Comparison tool. • The wine: We can’t talk about Madeira without mentioning the wine. Praised by kings and presidents, it is renowned for its quality and flavor. One drawback: Madeira has one international school. See Beth’s post on Madeira here. As many Greeks speak English as Germans, and obviously, Greece is one of the most beautiful countries in the world. But Greece still has significant economic issues. See Lynne Evan’s post here on the unvarnished truth about life in Greece. As noted above, we had originally not included Ireland on our list because it’s such an expensive place to live. But that hasn’t deterred a record number of Brits from applying for Irish citizenship. In fact, the number of UK citizens applying has doubled since the 2016 Brexit vote. About 100,000 eligible Brits applied for passports in 2018, up from 81,000 in 2017 and 46,000 in 2015, the year before the Brexit, according to the Guardian. And the truth is, if you’re relocating to Dublin from London, Dublin is 8-percent cheaper, according to Expatistan. So we goofed on this one ….